Drawings of roses are so beautiful to behold but not really recommended for novice artists to portray unless you are confident the results won't discourage you. The selection of roses on this page were completed in June 2007 and I had been drawing for just over one year at that time. Do you think that my practice is paying off? In comparison to last time, I felt they were easier to copy and my pencil flowed onto the paper with more surety. I remember I struggled initially and that was mainly due to the complexity of the rose. The insight from the recollection of my struggles tells me that it really is true that if you keep drawing, you will improve. I probably don't need to say this, but, drawing roses requires patience because the formation and folding of the petals easily confuses trainee artists. These drawings of roses were easy for me only because of the good photos that I selected to copy. When I browse books for a reference picture, I keep a lookout for a very clear picture. Ask yourself questions like "Does it clearly show the areas that need shading?" or better yet, "Does it look easy enough for me to draw?" 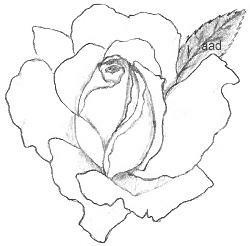 I discarded several photos because they didn't show me what I needed to see to draw a rose successfully. The delicate petals and fragrance makes the rose one of the most popular plants in gardens around the world. However, they demand more care and attention than many other plants. Transfer that information straight to the art of drawing a rose - that is, the rose is a popular drawing subject which demands care and attention. The only difference between tending roses and drawing roses is that you can't smell a drawing! This is my drawing of a miniature rose that I copied from a gardening book. 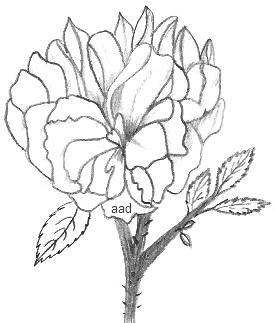 Below is a drawing of a shrub rose - it is an old fashioned rose that has returned to fashion. Old fashioned roses have been grown since Egyptian times. These roses, with their soft form and lovely perfume, have their own special charm. They are probably the easiest rose to maintain and if allowed to grow wildly, they give a rambling appearance. I was quite surprised this drawing turned out as well as it did! 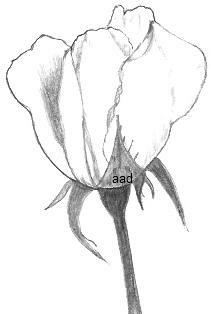 To draw and copy from an easy example, here is a contour drawing of an old fashioned rose. Modern roses have been bred to have long lasting flowers with sturdy stems. The new type of flower is bigger and there are numerous bright color combinations. 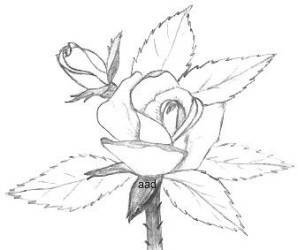 See if you think I have improved since I first drew these rose pencil drawings in January 2006. 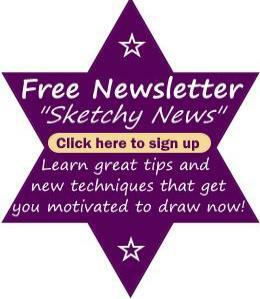 To start your drawings of roses, sketch lightly to get the basic shape. Don't worry about detail yet, just try to get accurate lines. I draw simply by looking and copying. It's your choice to use other helpful tools to get images down on paper successfully but for a start, I like to see what I can produce freehand. Keep in mind that most roses have 5 petals in each layer. Once you have the outline, scribble in places that you can see need shading. Squint your eyes if you have trouble picking out the shadows. Notice that there are shadows under the petals. Does it look good to you so far? If you're confident it is right, start to put in your lines more firmly. Then, proceed to do shading, lightly at first, and then progress on to dark. Going from light to dark allows you to erase any mistakes and it's much easier to erase the lighter strokes. 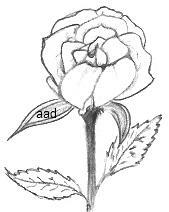 There is no denying that drawings of roses need attention to detail. Also, when you are drawing roses, make sure your rough outline portrays the beauty of the rose because this gives you a good foundation for your drawing. In every rose drawing, all shapes, shadows and highlights give a more realistic effect. Don't forget to hold your drawing up to a mirror for that final confirmation that it is perfect.